Once again I have amassed another wave of Marvel Legends. This time around we are building Warlock. The wave is another lovefest for the X-Men. We have some mainstays from the team, as well as some outliers. I have already looked at Colossus back a bit. Now I have the rest of the team and I am bringing the whole line to you right here, right now! Wolverine in the future. He is the only figure not to come with a build a figure part for Warlock. And really, that is no problem. Either you want this guy, or you don’t. And in most Legends collectors, this is a guy you want. I am sure Hasbro bet on that, since they did not give him a BAF part. The other could have been the Jim Lee designed Cyclops, That one would have sold too. We once again get a figure that is in normal street clothes. And that is a GREAT thing. These figures looks fantastic in regular clothes. Logan is sporting a bomber jacket that is unlike what anyone else has so far. He also comes with the newer Wolverine fists that have the removable claws. Best innovation of the last year for the Legends line. Dazzler is an interesting choice of figures and subject for the Marvel Legends line. There is no doubt that this lady that looks to be pulled right out of the 70s is going to stand out among the other Legends on the shelf. She is actually a product of 1980. I don’t think disco was quite dead yet, but it was on it’s way out. Dazzler can create light using sound and vibrations. This seems to be a power akin to Jubilee. Not the strongest ability, but useful in different settings. She is also quite a good athlete. She is a martial arts expert as well as a good rollerskater. Speaking of rollerskates, I never thought we would get a figure in rollerskates. This has to be a one off feet design. I can’t imagine that there are other rollerskating superheroes out there. A very nice touch. She comes with a microphone, since she is a good singer, and she can use the sound of her voice, only after it has gone through a speaker. She also comes with the very common wrist power. This time showing up in a rainbow design. Shatterstar was created in the (surprise) 1991, by (surprise) Rob Liefeld. Okay, no surprises here. Everything about this guy SCREAMS 1990s comics. From the face and hair, to the shoulder pauldron, to the high boots and long gauntlet gloves. Not only two swords, but a double sword. He has it all. He is a bit of a stretch to make the X-Men team. He has been in X-Factor, and X-Force, but I don’t think he was ever a full-fledged X-Men. A good guy, a bad guy, a Horseman of the Apocalypse, an X-Men, and a member of Big Hero 6. Shiro Yoshida has done it all. Now he is immortalized in Marvel Legends glory. It didn’t take much to make a standard buck into Sunfire. They made a new head (well detailed), a belt, and gave him flame hands. This seems more like they looked at the parts they had on hand and tried to figure out who they could make with minimum effort. That is okay with me. Let’s get some crazy figures we would have never thought would get made. Less Captain Americas and Iron Men, and more of this kind of figure. Not only is this Cyclops, but this is probably the most recognizable suit Scott Summers have ever worn. The bright blue and yellow, with the straps around the chest. Jim Lee hit it big time when he created this suit. It was even the suit used in the cartoon on TV. This may be the quintessential Cyclops for all time. We are definitely well on our way to building a full team of 90s X-Men. Polaris has the powers of Magneto. He used that to his advantage to pretend to be her real dad. Turned out not to be the case, until 2012, when it was revealed that Polaris’ mom had an affair with Magneto. Yup, Magneto had three kids, and only one of them got his powers. Can’t explain the other two. So it is no big surprise that Lorna Dane dresses similarly to her half-sister Scarlet Witch. Her backstory is a lot more interesting than the figure. Very basic in design, using the female buck, and adding a new head, cape, wrist gauntlets, and effects. Even her face tells us she knows she is boring. Come to think of it, with the exception of Logan and Warlock, nobody has an expression. Strange. There is no surprise that this strange unit was created by Chris Claremont and Bill Sienkiewicz back in 1984. Computer technology was new and exciting, and to think that there could be life on other planets that had techo-organic beings was all the rage. It wasn’t long after that Transformers came out, with a whole civilization that is also techno-organic. This figure is large and imposing. One of the biggest BAFs we have had in a long while. He stands over a head taller than Colossus, and even he is a head taller than the rest of the figures. He is so big, his waist is at shoulder height of the rest of the men. He has a great face, good articulation (for a big man), one fist and one open hand, and a nice sturdy base of big feet. The colors are well done with a metallic gold wash over black. This is an interesting team. There is a wide range of X-people from all over the time line from the 80s to now. This set allows you to fill in some gaps in teams, from everything with an X in the title. Logan and Cyclops are the standouts of the wave, with Colossus looking good, and Warlock being a lot of fun. I can’t help but think that Sunfire and Polaris were easy filler figures to just throw in there among the new parts heavy Dazzler and Shatterstar. I was gone on a 21 day road trip with my wife and dog. We got a travel trailer and took it out on the maiden voyage. 21 days, 11 states, 4200 miles. Along the way I was able to stop in a plethora of WalMarts, Targets, a few Toys R Us’ and a couple of Walgreens. I even made it to a Fred Meyer in Oregon, which is owned by Krogers, so they had lots of Hot Wheels. Wow, mom! Thanks! This was an amazing surprise of a gift for Christmas. I guess it pays to have a well read mother. She did not know how much I would like it though. I think I surprised her with how much I appreciate it. This book is a hardback print of the entire Batman: Hush storyline. 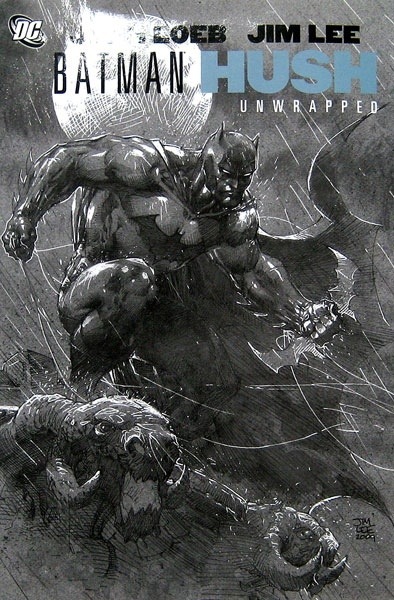 The “Unwrapped” part of the title is in reference to the art meting just the pencil work by the amazing Jim Lee. The work is beautiful all on its own. Can’t wait to sit down and read the story again for the first time.